While I’m not in college anymore, it’s been some years now, okay…I still remember how much I loved constantly buying anything and everything Chi Omega, especially when I had a little to spoil! PS: Even in our 20’s I still try to spoil her now and then. Whether it’s buying things for New Members after Bid Day, during Big/ Little Week, or Sister Appreciation Week, super cute sorority gear can certainly add up in $$$. I was so happy when A-List Greek reached out to me, and I seriously wish A-List Greek had been around while I was in college, I would’ve bought everything they had!! Every girl needs a hair tie, and a bunch of hair ties at that. These super cute Sorority Hair Tie sets are on sale for $6! Such an easy present for a sister! They have a great stretch, and don’t snag at hair, or break. I was also sent the Chi Omega Metallic Temporary Jewelry Set, and I kept thinking how great it would’ve been to wear this on Bid Day, during a skit, or to a philanthropy event. It’s just a cute little way to show your sorority pride. Lastly, I was sent these adorable Chi Omega stackable rings, which were my favorite from what I received! This really is the perfect gift for your Little or best friend. The sizing is adjustable, they’re available in rose gold, gold, or silver, & at a $30 price point they’re very affordable for a college girl! It’s impossible to not at least browse this site for some great sorority gift ideas! A-List Greek also offers free shipping over $60, so you and a few sisters can place an order together to save some $$ on shipping. They also offer Group Orders, for any new member gifts, or initiation gifts, your chapter may want to purchase. Def check them out, as I said, I wish A-List Greek had been in business when I was in college, I would be a repeat buyer for sure!! I’m obsessed with Charming Charlie. Too obsessed. I used to only be able to shop in-store when my Dad was living in Georgia, and until Black Friday I hadn’t been in one in years. Luckily, a Charming Charlie opened up in New Jersey, so when I was home for Thanksgiving weekend I literally lost my mind and bought everything I saw- even my Mom got hooked immediately. Charming Charlie has changed so much since I first walked into one, 6 or 7, years ago. I love how the brand has expanded into way more accessories and now even home items. The best part of Charming Charlie is the price point, everything is affordable, on trend, made well, and suer gorgeous. If you’re like me it’s so easy to go Christmas gift crazy. I have so many important people in my life, and when I see something I think they’ll like, I feel this overwhelming need to get it for them! The truth is, Christmas shopping can get a bit out of control. I have a work Secret Pal, as we call it, coming up, and I want to get my best girlfriends something small, so here’s a quick girlie guide for some wallet friendly Christmas gifts this season, specifically from Charming Charlie. As you may know, October is Breast Cancer Awareness month. This is a huge month for raising awareness to the most commonly diagnosed cancer in women. Did you know, 1 in 8 women will be diagnosed with breast cancer in their lifetime? It seems unreal to me that a disease like this still doesn’t have a cure. While breast cancer doesn’t affect my family and I directly, I do have quite a few friends who have had to cope with family being diagnosed. Enough is enough, and as a social and loud generation, we need to do all we can to raise awareness, and find a cure. Throughout this month tons of brands, restaurants, and sports teams will show their support for Breast Cancer Awareness by wearing pink and giving portions of sales to help the cause. While this is all important, of course, it is also important to educate yourself on the issue- here is a great fact page from the National Breast Cancer Foundation. Supporting the cause is maximized when you’re actually educated about the issue. 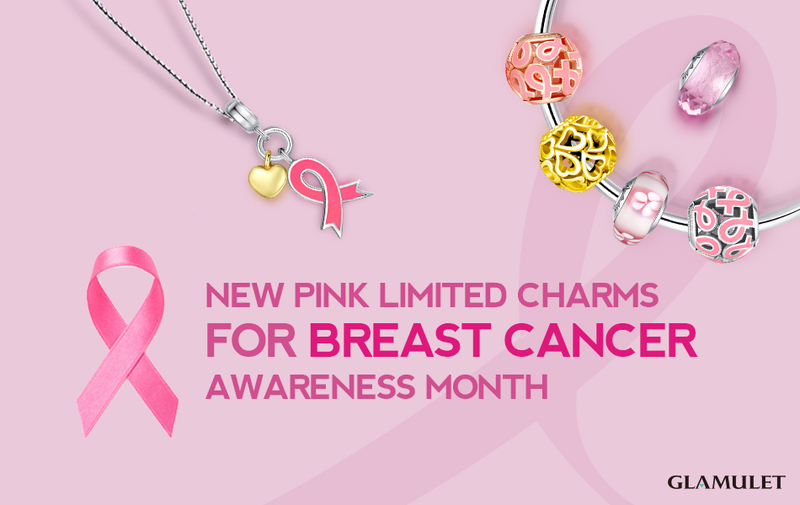 I’m proud to be teaming up with Glamulet on their Pink Limited Edition Charms, which were created to support the Breast Cancer Awareness Campaign. 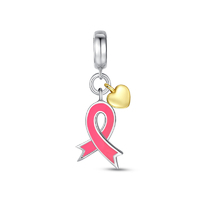 For every set of Pink Charms added to your cart, 50% of what you spend is donated directly to breast cancer charities. 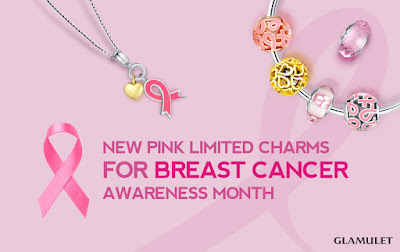 I highly suggest checking out their Pink Charm selection, they’re affordable (actually, they’re on sale right now! 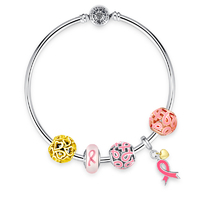 ), and fit all major brands of charm bracelets. I’m also loving their complete bracelets, which are also on sale, and in stock! The most important part of this month is educating yourself and learning about ways you can help the cause. I encourage you to take time out to explore ways you can support Breast Cancer Awareness and help to empower women from this deadly disease. With spring in the air a girl needs some punchy new jewelry, you know what I mean? I was lucky enough to come across the site Majestical, and as soon as I saw the styles I knew I needed to shop around a bit. Not to mention, the prices are totally awesome as well…$9 earrings, yes please! Earrings, bracelets, necklaces, and charms, you name it, Majestical’s got it. 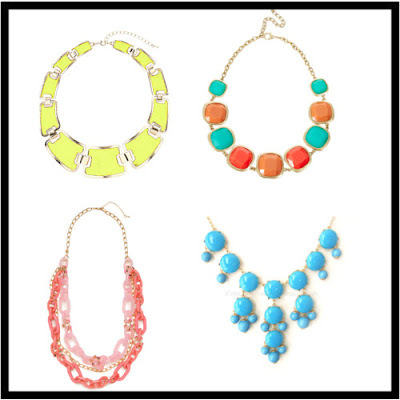 I’m loving their brightly colored earrings, pastel bangles, and chunky statement necklaces. With each of these pieces below being $30 or under, it’s super easy to add a few new pieces to your spring jewelry collection this year! Here are some of my Majestical favorites as I was browsing around. I love the shape of those turquoise bangles, they look so light and elegant. The multicolor chevron necklace would look amazing with a black sundress, to make those colors just pop. & those fuchsia earrings scream brunch to me for some reason. Spring is in full swing. Today I’ve been thinking about sprucing up my jewelry collection with some bright necklace additions. I’ve come up with four affordable contenders, of course I feel I need all of them, but that’s a separate issue! Here are my new JewelMint pieces from January and February!! I got the heart ring for free, it was JewelMint’s Valentine’s day promotion when you purchased your February piece, so of course, I had to get it! If you’re interested in signing up for JewelMint (which I highly suggest) click here and get 50% off your first piece with the code JMSALE50. I seriously love love love this first piece, the Huston Heritage Bracelet. It’s retro and fun, and definitely a statement piece. I love the shapes, and I think the style is so unique. This next piece, the Call to Arms Bracelet is simple but still fun and elegant. Since it’s not too showy, I’d do a big statement ring with it. The clasp is difficult to get on by yourself though, which is always annoying. For that type of closure I think you need to make it a little bit longer so there is enough room to maneuver it, but oh well. This last piece I got for free with my February credit. It’s a super simple ring, but I like the color and the skinny band. I think it can match a lot, and it’s nice as an everyday piece. My monthly credits at JewelMint for some reason slipped my mind in between finals, work, and the holidays a couple months ago. So, I was very excited to see three credits in my account when I logged on a few weeks ago! These are the two pieces I picked out, once again I loved my selection to choose from and now that I have them, the pieces look great! If you’re unfamiliar with JewelMint, check out this past post where I explained this now extremely popular jewelry of the month club! Last time I showed a JewelMint piece was back in September, you can check out that piece, the Savoy Bracelet, here!! I picked this first bracelet because it’s inspired by Marilyn Monroe. I think it’s so gorgeous, and it’s easy to match with most outfits I have. The color scheme of black and silver is right up my alley, so I have a feeling I’ll be wearing this bracelet quite often. I thought the color of these earrings was so pretty when I saw them online, loving the purple hues. These will be the main focus of my look when I wear them, doing minimal, probably gold, jewelry for the rest of the look (i.e. some simple bangles, and a simple elegant ring). PS: Slightly unrelated, but still important: my monthly Birchbox’s are sent to my school address, which I clearly haven’t been too in over a month, so I will do a post of all my Birchbox goodies when I get back to school next week! Author ElizabethPosted on January 18, 2012 January 15, 2018 Categories FashionTags JewelMint, JewelryLeave a comment on New JewelMint Baubles!! I think this bracelet is beautiful! It’s elegant and antique-y, but still fun. I love that you can adjust the length, because it was a little big and too loose when I first put it on. I hadn’t been so pleased with my last month choice, but I’m more than happy this with this month’s! Sign up for JewelMint here and complete the Style Profile to find the best matches for you! I’m in the Atlanta area (Suwanee, GA to be exact) visiting my Dad for the week. Unfortunately, but excitingly (I didn’t know that was a real word), he’s moving to the Fort Worth area in a few months. While I know I’ll be in the city area of Atlanta still quite often, one thing I will miss is the jewelry store Charming Charlie which is just about a 10min drive from our house. I had absolutely no idea what Charming Charlie was until I walked passed it one day, at which point I turned my head and thought to myself OMFG I NEED EVERYTHING IN THIS STORE. Literally. I truly felt like I hit the fashion jewelry mecca. If you’ve never been to, or heard of, this store before I have one word to describe it…color. TONS OF COLOR. It’s a huge store (at least the one by me is) and all the accessories are divided up by color on huge round tables. Also, everything is super inexpensive, think one step above Forever 21 in price, but a flight of stairs above them in quality, which is why I always seem to walk out with half the store. Before I get started on my haul, here’s a quick commerical from their YouTube channel! (PS: Check out all their videos on YouTube, they’re great!!) They also have a a blog, Charm Chronicles, which while I’ve only read a few posts, looks pretty good!! Here are my purchases!!! Unfortunately you cannot buy their products online…lame. But check out the store locater because you never know if there’s one near you!! I just found out there’s one about 40mins from my house in Jersey!! Enjoy! I love classic looking pieces like the one on the right that I can dress up or dress down. I have a few necklaces along the line of this one but I love the layered look and I have great bracelets that will complement it! The black and silver necklace with flowers reflects my true style and I know that one will get a lot of wear. I loved these earrings when I saw them, I think they could go both in a casual and elegant direction. I actually have a bracelet that will match perfectly with them! I love that color blue against a rustic gold color, and the shape with that coloring looks great. A cute flower power ring, just because. I thought it was summery and I could wear with a black outfit for a pop of color, or at the beach! And, an owl ring because owls are our mascot and I can’t help myself when I see owls! Two owl necklaces one gold and one silver. As I just said, I can’t help myself when I see anything owls, and the price was right, so I went with it! I don’t think you can tell but the other necklace is gold with a hint of copperish color to it. I thought the coloring was interesting and I would have the focus be on the necklace when I’m wearing it since it might be hard to match other pieces with it. Another owl, this one kinda looks scary but it has abuncha purples in it which is why I liked it so much! I loved this drop ring because of the color and while it’s still a piece of fashion jewelry I know I’ll be able to dress it up if I want to! I thought this necklace was really pretty and I absolutely love the colors. It’s light and perfect for the summer– I think I’ll layer on tons of bracelets with complementing colors when I wear this. I know this bracelet is a little loud and ridiculous, but I really don’t care…I think it’s fun and unexpected. I have an all black bathing suit that I know this bracelet will look great against when I’m at the beach. It might be hard to incorporate this into a lot of outfits, but I think its a great easy option for the shore.